First Lady Christine Solomon is a strong advocate of the family unit and views each member in Christ as part of her extended spiritual family. She is a visionary at heart and has seen God bring many visions into reality during her ministry. 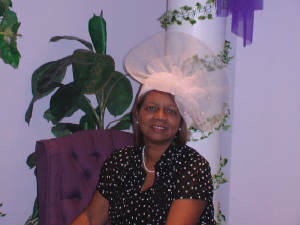 Lady Solomon has “the spirit to serve,” as she has served the church in many aspects since childhood. She is currently the Director of the Women’s Ministries, “Sisters of Vision”, at Refuge Vision Ministries Houston, Texas and Director of the Women’s Ministries at Refuge Temple Atlanta, Georgia both under the dynamic leadership of her loving husband and Pastor, Dr. Elijah Solomon. Her vision is for the people of God to develop spiritually, intellectually, and physically serving our Lord Jesus Christ. Lady Solomon completed a Bachelor of Science Degree in Sociology and trained as a Social Worker with the Department of Health and Human Resources. Also, she has a Bachelors of Science Degree in Psychology and completed an additional Elementary Education Degree. Prior to her retirement from public education in May 2006, she taught for 23 years as an elementary school teacher in the Houston Independent School District. She was acknowledged among her peers as the Outstanding Educator of the Year in 2000 and nominated for Who’s Who among American Women in 2006. Lady Solomon has the ability to communicate and minister cross-culturally and inter-generationally the love she has for Christ and the ministry. She is thankful to God who is prospering the Ministry where families are being blessed as they find their purpose and develop their potential in Christ. Lady Solomon has served the body of Christ both on the national as well as the local level. She served as the corresponding secretary for the International Sunday School Churches of Our Lord Jesus, and served as treasurer for the Ministers’ Deacons Wives Guild Texas Diocese. In addition to that she was elected as president of the Texas Diocese Apostolic Academic Teen (AAT). Various churches and organizations often requested her to serve as a workshop facilitator and conference speaker on relationships, marriage and family issues. Lady Solomon’s favorite scripture, “The Lord will perfect that which concerneth me, thou mercy O’Lord endureth forever, forsake not the works of thine own hands (Psalm 138:8),” exemplifies the way she lives her life with a “Spirit To Serve.”. Lady Solomon is the proud mother of two daughters Eleshia Monique Spence (Wally) and Keturah Davis (Ulysses), and four wonderful granddaughters and three handsome grandsons. To God Be The Glory!